If you have been in commercial buildings or retail stores, you have seen wall-hung toilets but probably never noticed. The advantage of a wall-hung toilet is that you can install them on the wall at a height that works the best for everyone. If you are interested in a wall-hung toilet upgrade for your bathroom, then consider the following products we have reviewed. Wall-hung toilets are ideal for bathrooms that have limited space. They are more compact and do not protrude as far from the wall as traditional toilets. Look at the product reviews below and then look at our FAQs section at the end for more information. If you want to give your bathroom a modern look, then consider this wall-hung toilet from Toto. This toilet bowl will give your bathroom a sleek appearance and turn it into a spa-like environment. The bowl is a must if you have a compact bathroom with little space. It will save space since the tank portion of the bowl is embedded in the wall. I like this toilet because it has a dual flushing system. If you only need a light flush cycle, you will only use 0.9 GPF (gallons per flush) of water. For a full flush, this toilet bowl only uses up to 1.6 GPF. The elongated shape of the toilet bowl gives you more room for better comfort. The skirted design allows for easier cleaning smoother lines. This toilet appears to float above the floor to give your everyday bathroom a more futuristic look. This is a perfect choice for your bathroom remodel or new construction project. If you want to help the environment or lower your water bill, then the Toto Aquia toilet may be the right choice! This dual-flush toilet conserves water by only using 0.9 GPF of water with the light flush. For a full flush, it still conserves water with only 1.6 GPF of water usage. The high-gloss ceramic glaze on this toilet bowl prevents debris and mold from sticking to the ceramic surface. This makes it easier to clean the toilet with fewer harsh chemicals. This toilet bowl is a wall-hung toilet that requires a corresponding in-wall tank system. 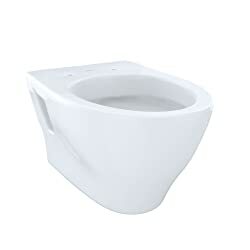 The elongated bowl gives you more room and comfort while using the toilet. This bowl does not come with a toilet seat, but you can choose the one that fits your needs the best. This bowl will extend only 21-inches from the wall, leaving you with plenty of extra walking space in your bathroom. 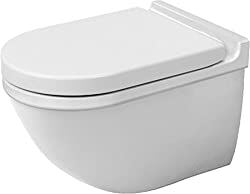 This Duravit toilet is coated with WonderGliss which is a coating that is baked into the ceramic. This coating protects the toilet from any dirt or limescale buildup. This makes cleaning the toilet easier and you do not need harsh chemicals to get the toilet squeaky clean! The toilet has an elongated bowl that is wall-mounted to give you extra space in your bathroom. It has a concealed trapway that completely hides all the plumbing and pipes for the toilet. The skirted toilet makes it easier to clean the outside of the bowl without any edges or nooks where dirt can accumulate. The toilet bowl is a standard height and is considered ADA compliant when installed with a seat height of 17-inches to 19-inches from the floor. This toilet bowl would be a great addition to your bathroom! 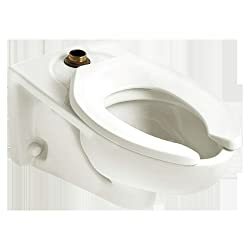 This is a wall-hung elongated toilet bowl with a single flushometer valve. It is a high efficiency, low consumption toilet with only 1.6 GPF of water usage. The flushing system uses a direct-fed siphon jet flush action for powerful flushing performance. This toilet has a fully glazed 2 ⅛-inch trapway for strong volume flushing. The elongated bowl gives you more room and comfort during use. This product does not include the trip lever for flushing and it does not come with a seat. These are additional items you can buy to match your bathroom decor and style. If you want to give your bathroom a sleek modern look, then consider this product from American Standard. If you want to give your bathroom an uplift in appearance and style, then consider this Kohler toilet bowl. Its elongated shape gives your more room and comfort while using the toilet. It is a one-piece wall-hung toilet in which all the mounting hardware is completely concealed. It has a skirted trapway that is smooth and allows for easy cleaning. The dual-flush system allows you to choose between a 0.8 GPF light flush or a 1.6 GPF bulk waste flush. Durable steel frame brackets are installed in the wall to provide the utmost strength and performance. This also gives you flexibility to set the bowl from 15 ⅜-inches up to 28 ½-inches from the floor! The space saving features of this toilet gives you up to 12-inches of precious bathroom space back! If you are looking for a space saving, low water consumption product, this Kohler toilet is the right choice. Before you choose a wall-hung toilet for your bathroom, review the answers we have provided for frequently asked questions. 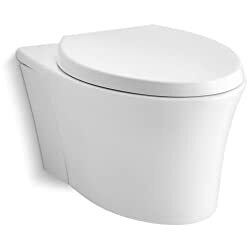 This will give you information on features of wall-hung toilets that are important and will ensure you select a quality product that will last a long time. Open the wall where the toilet will be mounted. If necessary, modify the wall framing to support the in-wall water tank. Plan and run the water supplies and the waste plumbing. Install the toilet water tank in the wall cavity. Rough in the discharge plumbing. Install and connect the supply plumbing. Install the flush actuator access panel. Finish the wall over the in-wall water tank. Mount the toilet bowl and connect the plumbing and supply lines. Caulk the toilet bowl and mount the toilet seat. Test out your do-it-yourself handiwork! If you are interested in installing a wall-hung toilet in your bathroom, you want to first be sure you have a stud wall or section of your wall available to build a frame for your in-wall water tank. The in-wall water tank requires a carrier frame for mounting the water tank in the wall. You need to know if you have 2×4 or 2×6 studs before you buy your wall-hung toilet as you will also require a mounting frame that fits the stud size in your bathroom. You want to be sure you have enough space for the toilet bowl itself. Find out how far the toilet extends out from the wall. Be sure to measure that same distance in your bathroom so you can see if it will protrude too much into the bathroom walking area. The standard weight load for most wall-mount toilets is up to 880 pounds. Usually, with wall-hung toilets, it’s the durability and strength of the wall that limits the weight load and not the toilet itself. Although the toilet can stand up under 880 pounds, it’s possible that the wall cannot support that weight load. As you can see from the product reviews, there are many features that distinguish one wall-hung toilet bowl from another. One advantage of a wall-hung toilet is the sleek appearance it provides. You also cannot discount the space saving qualities, which is important for compact bathrooms. Consider all the product reviews and FAQs before you make your final decision on which best wall-hung toilet will work best for you.